It's not the presents I remember most about the first Hanukkah I spent with my now-husband's family, it's the latkes. Golden and crispy-crunchy on the outside, hot, tender and creamy on the inside, touched with just the right amount of salt. Mmmmm. Leave it to me to have fonder memories of potato pancakes than pearls, or whatever lovely gifts I received that year. Actually, I think it would make my mother-in-law proud that her crispy, golden cakes stand out most in my mind. That year we were living with my husband's parents. Since I'd never celebrated Hanukkah before, we did the whole shebang—lit the menorah, played dreidel after dinner, ate Hanukkah chocolate gelt, and fell in love with latkes. I'd love to help her make her family recipe again this year and suggested a new recipe she's game for us to try: the Golden Turmeric Latkes with Applesauce from EatingWell's November/December issue. 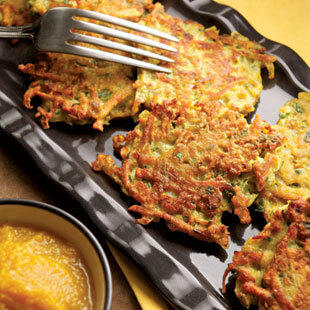 These sun-yellow-hued latkes are spiked with turmeric, an anti-inflammatory, cancer-fighting spice native to India and served with spiced applesauce for a new, healthy twist on the tradition. Click here for a Hanukkah dinner menu with this recipe, a delicious roast chicken and more. Active time: 45 minutes | Total: 45 minutes | To make ahead: Cover and refrigerate the sauce (Step 1) for up to 3 days. 1. To prepare sauce: Heat 1 tablespoon oil in a small skillet over medium-high heat. Add ginger and cook, stirring, until light brown and aromatic, 30 seconds to 1 minute. Stir in turmeric and cloves. Cook until the spices are fragrant, 30 seconds to 1 minute more. Scrape the spices into the applesauce in a small bowl and stir well to combine. 3. To prepare latkes: Thoroughly mix potatoes, onion, chiles to taste, cilantro, flour, cumin, salt, turmeric and eggs in a large bowl. 4. Heat 1 tablespoon oil in a large nonstick skillet or griddle over medium heat. Place a heaping tablespoon of the potato mixture in the skillet and flatten with a spatula into a disk roughly 3 inches in diameter. Form as many latkes as you can in the pan without overcrowding. Cook until golden brown and crispy on the bottom, 3 to 5 minutes. Flip and continue cooking until the other side is golden brown and crispy, 3 to 5 minutes. Briefly drain on a paper towel-lined plate, then transfer to the oven to keep warm. Repeat with the remaining oil and potato mixture. Per serving: 187 calories; 9 g fat (1 g sat, 5 g mono); 71 mg cholesterol; 22 g carbohydrate; 0 g added sugars; 5 g protein; 3 g fiber; 221 mg sodium; 327 mg potassium. Note: Chickpea flour, or garbanzo bean flour, is commonly used in Indian and Middle Eastern cooking. It's a gluten-free alternative to wheat flour. Look for it in the gluten-free or bulk-foods section of large supermarkets and natural-foods stores or online at bobsredmill.com.